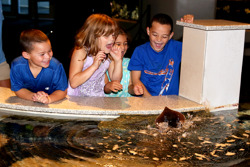 Campers at the N.C. Aquarium at Fort Fisher will do all this and more. They make new friends, engage in educational experiences and outdoor adventures. Trained marine educators lead activities and introduce campers to live animals in a safe and fun atmosphere. Camps explore coastal adventures including crabbing, beach fun and much more. Themes and activities change keeping the camp experience fresh and exciting. Space is limited and camps fill quickly. Day Camps run at various times throughout the traditional and year-round school calendars with limited space for campers ages 5-12.